It should come as no surprise that celebrities often have a significant impact on smartphone-wielding millennials and Generation Zers' beauty preferences. 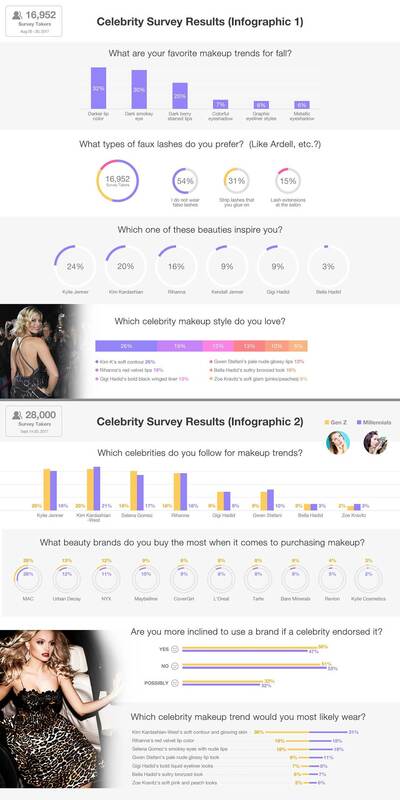 Perfect365 recently conducted a survey of its users on the topic of celebrity beauty trends. The company states the survey included 28,000 millennials and Gen Z users. When asked which celebrities are followed when it comes to makeup trends, millennials preferred Kim Kardashian West at 21% and Gen Z preferred Kylie Jenner at 20%. When asked which beauty brands are purchased the most, both millennials and Gen Z came in at 28% for MAC Cosmetics. When asked if they were more inclined to use a brand if a celebrity endorsed it, 53% of millennials said no with 51% of Gen Z users also saying no.